If you think visiting California once is enough, you are not right. We are back in California to spread the word about DECENT. Every DECENT “roadshow” has a special reason and this time is not different. The reason why we came back after two weeks was to attend several meetups and Coin Congress conference in San Francisco. This time in a different line up. Matej Michalko and Martin Polacek heading to the USA!!! Journey to the USA took quite a long time, approximately one day. From Vienna to Zurich, from Zurich to New York and then finally from New York to San Francisco. The first issue we encountered when we landed in San Francisco was our missing luggage – unable to be located by anyone at the airport. We have managed to buy some necessary stuff in the local stores for the time being. Our arrival was planned three days before the Conference. After the long journey we were resting for a day. 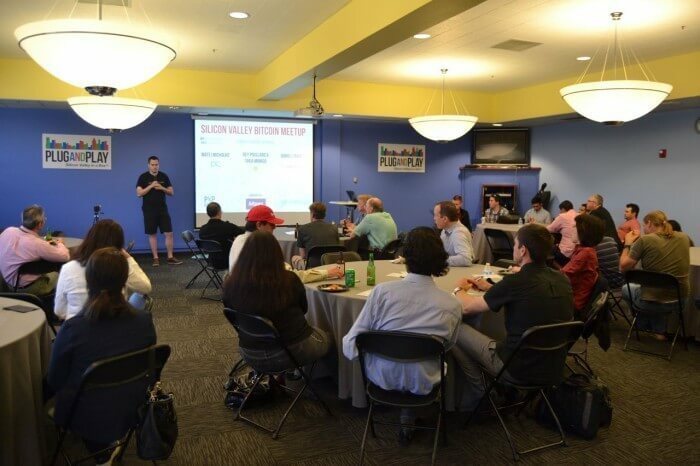 The second day we attended our first meetup in Silicon Valley in Plug and Play center. Among other speakers such as Daniel Cawrey from Zapchain or Guest speaker Shea Manigo speaking about Amazing race of Bitcoin, there was also our founder Matej who held his speech about DECENT platform and the world of media those days. We met a lot of interesting people at that meetup. Especially big thanks to Edward – a very inspiring person who we were able to talk to after the meetup till midnight and who gave us a lot of interesting insights. Matej and Michal also met him during their stay in California two weeks ago. Next day we had to attend networking party for the Conference. But there was a big challenge in front of us. We had to buy a cage for our exhibition stand. It was funny because we visited almost 5 places (pet shops) to find the right DECENT exhibition cage. In each shop we had to face questions: “What kind of dog do you have?” You can imagine the shop assistant’s reaction to our answer: “Actually, we need it for different purpose”. Finally, we bought the right one and could move to San Francisco for Coin Congress networking party. Unfortunately, we missed the party because of enormous traffic outside the city. We did not expect such a rush hour. After being stuck in traffic jam for an hour and half we decided to make a U-turn and hit the road back to the hotel to prepare for the Conference. Alarm clock was set up a little earlier to “catch the train”. Coin Congress was waiting for us to exhibit and represent DECENT. Exceeding our expectation we came to the conference hall very first. Nobody was there. 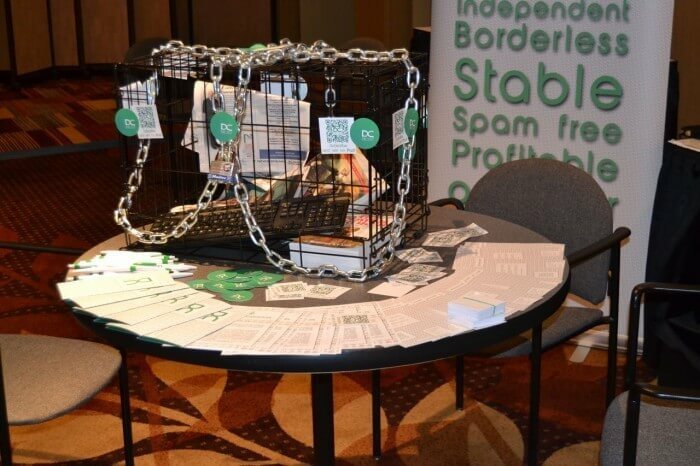 We prepared our exhibition stand, cage and were waiting what would happen next. Well, our exhibition stand was not at the very best place in the conference hall. It was in the corner where nobody was passing. The second person who arrived was Tiffany Madison, Vice President of Coin Congress and afterwards the other exhibitors joined. The Conference started with a small number of people. The first bigger group came approximately around 10:00 AM before Matej’s speech. I can tell you that it is really an amazing feeling – looking at people coming to your stand and finding your project interesting, worth of discussion. An attractive value for DECENT visitors was also our iPad competition. Everybody who visited our exhibition also subscribed. The Conference ended at 6:00PM. Having packed our awesome exhibition stand we went for a drink to The Jones Bar where the after party of Coin Congress was being held. One big table for everyone and one big space for sharing experiences and impressions from the event. One of the after party attendees was our friend from Plug and Play meetup. He offered to show us a bit of the city. First we went to a small brewery, as Matej is a big fan and beer aficionado he wanted to taste some American beers. After the brewery we continued our visit to the Cocktail Bar in American style from the 30’s where Matej discovered new “dimension” in the world of beverages. Mexican Coca-Cola. After a while we were so tired from the busy day that we decided to head back to our place in California. 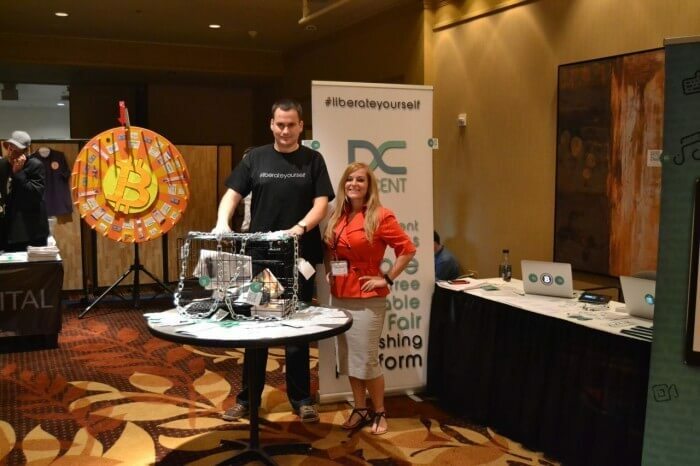 It was an awesome experience for me as I attended Crypto Conference for the very first time. We met amazing and inspiring people with whom we could share experience from the Bitcoin World. We are staying with Matej in California for two more weeks and I cannot wait to come back to you with other stories about our DECENT business trip.